Full House: Gov. Timothy Kaine (at podium) announces the Rolls expansion in Richmond. Rolls-Royce is bringing a $500-million, 500-employee plant to Virginia, and it's planning on a long-term stay. "Rolls wanted an education system developed for a 100-year pipeline of workers," says one key state player in the project. Work-force quality was "a make-or-break factor for Rolls," says the Virginia Economic Development Partnership's Liz Povar. with an outsized expansion payload: a US$500-million, 500-employee jet engine plant on a 1,025-acre (410-hectare) site in Prince George County – in short, a bona-fide blockbuster. But the Virginia expansion that Rolls announced on Nov. 20th could pack even more economic muscle than that. "This project has very long legs, and it has depth," Liz Povar, director of business development for the Virginia Economic Development Partnership (VEDP), tells the SiteNet Dispatch. "We believe there's a great opportunity for the Rolls plant to be the OEM of aerospace in Virginia, much like an auto plant. We anticipate that there will be a supply chain following. " Rolls picked the Old Dominion State for its far-reaching expansion plum after an extensive site search. The London-based firm dug deep in researching a host of factors at multiple locations, consistently pushing for long-term solutions, Virginia officials say. Rolls put particularly heavy emphasis on fusing work-force quality with educational excellence, extending from K-12 to higher learning. That focus made the University of Virginia and Virginia Tech vital project players. The two schools are creating, on the Rolls site, one of the expansion's most potent job-generating elements: the Commonwealth Center for Advanced Manufacturing. "Rolls made it clear up front that they expected a higher-education solution to be part of our answers," Povar explains from her Richmond office. "The pipeline of engineers and the ability for the company to have a highly articulated and well-qualified research and development relationship with institutions like UVA and Virginia Tech was definitely one of their fundamental drivers. Rolls wanted to see an education system developed for a 100-year pipeline of workers." Rolls officials reiterated that long-range view at the expansion announcement at the state capitol in Richmond. "We're a long lead-time business," Rolls North America CFO William Powers told the packed room. "Our products live 25 years." Rolls' lead time for its site search was considerably shorter, starting late last year. "Rolls-Royce has begun the process of considering options for potential new facilities around the world," the company formally announced on Dec. 1st, 2006. "New facilities would provide . . . greater capacity, strengthened business continuity [and] increased global competitiveness." But Rolls by then had clearly done some initial strategizing about potential sites. The company in October of last year sent out requests for qualifications (RFQs) to eight selected U.S. states: Georgia, Indiana, Mississippi, North Carolina, Ohio, South Carolina, Texas and Virginia. Rolls also notified other countries, but declined to name them. Later, though, it became clear Singapore was a prime global contender. When that 2006 RFQ was issued, Povar had already been regularly interfacing with Rolls' top North American officials for three years. Chantilly, Va., in Prince George County is home to Rolls' North American headquarters, as well as the global headquarters for three of its business units: corporate and regional aircraft; helicopters and small gas turbine engines; and energy. "Rolls is one of the VEDP's target accounts," Povar says of her ongoing connection with the company. "We target certain select companies we want to build long-term relationships with. We do that so they know they are an important part of Virginia's economy, and so, if they ever think about expanding, they will think of Virginia first." Virginia was indeed one of the states that a growth-ready Rolls thought of. With its new project in play, the company wanted a wealth of additional specifics about Old Dominion, particularly its workers. "Rolls clearly had a high level of interest around anything related to labor, training, work force and higher education," Povar says. "Their consultant team went very deep in terms of analyzing the work force, thoroughly concentrating on it from both a quality and quantity level. They spent extensive time researching factors that included education levels, skill sets, regional draw areas and commuting patterns. "If there was a make-or-break factor on this project," she adds, "I think it centered on the work force." Rolls liked the labor pool it found in the Prince George area. "We're here for the people," Rolls-Royce North America President and CEO James Guyette explained at the project announcement. "These aren't just jobs we're talking about. Rolls was already a corporate sponsor at the University of Virginia's McIntire School of Commerce. These are careers with upward mobility and the chance to contribute to meaningful things." Rolls' 500 new Virginia jobs will be well-paying positions. Salaries at the plant will average $48,000 a year, county officials said. The facility will receive on-site higher-education support from the Commonwealth Center for Advanced Manufacturing. The University of Virginia's engineering school is building the facility, which it will share with Virginia Tech's engineering school. Some space will be reserved for Rolls' proprietary research; other areas will accommodate the company's collaborative research with the two universities. Rolls had years earlier established relationships with the two Virginia schools, regularly tapping them for leadership training and employee recruitment. The company is also a corporate sponsor of the third-year curriculum at University of Virginia's McIntire School of Commerce. Other Virginia colleges and universities will also be able to participate in the Commonwealth Center. "It is essential to us that we locate somewhere that has a vibrant education system," said Guyette, who called Virginia's educational infrastructure "a treasure." The Commonwealth Center's role in Virginia's economy will stretch past its integral support for the Rolls plant. The facility will also be a key catalyst in generating related expansions. "The Center for Advanced Manufacturing is modeled after a similar Rolls center in the U.K. in which the supply chain has become the membership," Povar explains. "The concept is that there are founding members of the Commonwealth Center and then there are tiered memberships. Complementary companies with ancillary types of needs and research interests will join." Virginia officials expect that a number of center member companies will site supplier operations on the Rolls tract, further sparking the area's economy. The state's existing aerospace manufacturing jobs pay wages 73 percent higher than the average Virginia worker's, according to the VEDP. All told, 16,000 people work in the state's aerospace sector, with those jobs almost equally spilt between manufacturing and research. Other major aerospace employers in Virginia include BAE, General Dynamics, Howmet, Lockheed Martin and Raytheon. 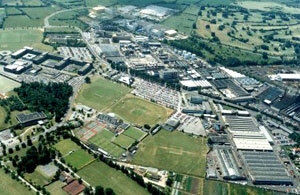 An aerial view of Rolls' roomy Prince George site. it was already zoned for industrial use as well. "That was absolutely a positive factor," Povar says of the Super Site that Rolls selected. "Mega-sites across the United States are rare. Mega-sites with infrastructure are more rare; and mega-sites that are appropriately zoned are even more rare." The site that satisfied the needs of a company thinking about the long haul was there because of some long-term thinking, Povar notes. "Prince George County about 10 years ago began looking at that property and assembling it," she explains. "The people in the county had the foresight to recognize that their proximity to the Richmond and Hampton Roads areas, plus the region's in-place logistics, meant that it was an opportunity. They realized that if they controlled that site, they could use it as a solution for selected clients." 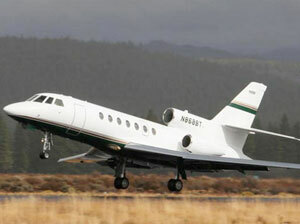 Prince George's expansive property provides strong transportation access. I-295 lies only a mile (1.6 kilometers) away, and Richmond International Airport is about a 29-mile (46-kilometer) drive. Prince George is donating the commodious property to Rolls, and it's expecting a significant economic return. In addition to creating well-paying new jobs, the Rolls operation will ultimately double the county's industrial tax base. Prince George officials also feel that the donation will be less capital-intensive than slowly developing the property and selling it off to individual buyers. For Rolls, the ready-to-go site speeds the expansion's time frame. The company is projecting that the project's first phase, a $100-million investment creating more than 100 jobs, will be completed and fully operational by the end of 2009. 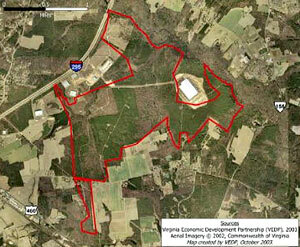 The Prince George property's status as a state enterprise zone also figures in Rolls' subsidies. That means that the plant qualifies for benefits from the state's Enterprise Zone Program and its Community Development Block Grant Program. Roll's 16-year incentive agreement with the state is also providing state training assistance, plus county tax breaks on business licenses, machinery and tools. Gov. 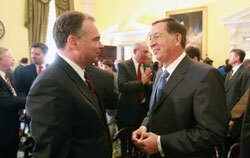 Timothy Kaine is providing another $6 million in Governor's Opportunity Fund grants, which will fund infrastructure including roads, sewers, utilities and water. All told, the state and local assistance could be worth about $56.8 million through the year 2023. Singapore (pictured) was in the running for part of the work that's going to Virginia. Most of the state's aid will be tied to Rolls' performance – which is exactly what the company wanted. "The company initiated the dialogue with us early on that we develop a support package that they were comfortable with – which they called a shared risk-reward model," Povar says. 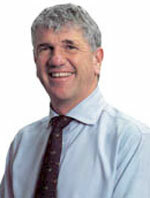 "That approach is much the same way that they work with their supply chain. "So we didn't look for answers in terms of incentives and investments that would just be fluff," Povar continues. "We looked for things that really made a difference to their bottom line." Virginia's subsidies also made a difference in keeping a major part of the Rolls plant from going to Singapore. The Asian city-state came close to snaring much of the work that will be done in Prince George County (for details, see accompanying feature, "Rolls' Growth Scenario Includes Singapore, Germany"). Rolls' Virginia plant will be able to make commercial, corporate and military engines. "This is not about building a box," Guyette said at the state capitol. "In this business, you never know what's next." of a $500-million investment and 500 new jobs is predicated on the F-136 moving into volume production. Rolls' decision to bring the plant to Virginia demonstrates that the U.S. remains in the running for high-end manufacturing, Povar asserts. "This project will be a premier university-based, R&D-based, technology-based operation," she says. "It shows that the U.S. can compete in this market space in advanced manufacturing." For Rolls, though, the obvious focus wasn't on national borders. It was on finding the strongest site. "From the beginning of this competition, Virginia understood our business needs and worked hard to put forward a world-class proposal," Rolls-Royce Chief Executive John Rose said in a statement from London. "We found people here," he said, "that could work with us." Rolls in Virginia will make both the F-136 engine (inset) for the F-35 Joint Strike Fighter and engines that power Dassault's new Falcon line of midsize corporate jets (pictured left). olls-Royce's current global growth certainly isn't limited to Virginia. 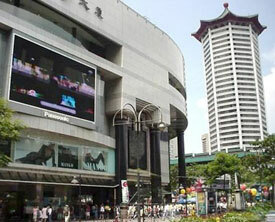 The London-based giant has also mounted major new projects recently in Singapore and Germany. Concurrent with the U.S. expansion in Prince George County, Rolls announced on Nov. 20th that it's adding a new 330-employee plant in Singapore. 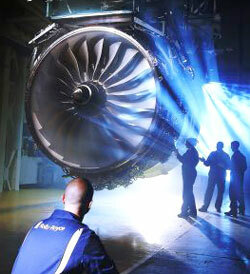 Rolls' Singapore operations will for the first time assemble the Trent 1000 engine (pictured) for the Boeing 787. Roll's headquarters city of Derby, England, is also home to the company's U.K. hub for engine assembly (pictured). in the hunt for a major portion of the work that will be done instead in Virginia. That stiff competition added to the importance of Virginia's project subsidies, says Povar. Rolls already has more than 1,000 workers in Singapore, including operations in aerospace maintenance, engine repair and overhaul, marine systems, and power generation and fuel cells. The company's latest addition on the island, however, represents a significant departure. The new Singaporean plant will assemble two commercial jet engines: the Trent 1000 for the Boeing 787 and the Trent XWB for the Airbus A350. That facility represents the first time that Rolls has moved commercial jet engine production outside of the U.K. Before choosing Singapore, the company negotiated with British officials for months about doing the Trent 1000 and Trent XWB work in Derby, England. Derby is Rolls' headquarters city and the company's U.K. hub for engine assembly. The Asian expansion decision came less than two months after Rolls spurned Derby for another project, choosing instead to locate a new test facility in Dahlewitz, Germany. The company also negotiated at length with the U.K. on that expansion before choosing the German site near Berlin. "The Germans value manufacturing," an anonymous senior Rolls official told the Financial Times after the German site was chosen in late September. "[The U.K.] government has chosen not to be competitive. Britain has caused this industry to export its capabilities." Rolls' two snubs of the U.K. are spurring political debate in Britain about strengthening national support for the company's manufacturing and research expansions. For its part, Rolls took a low-profile approach on the German and Singapore plants. The company didn't even issue a press release on the Dahlewitz project. The company's representatives' only comments to the press centered around the fact that the firm has invested more than $1.2 billion in the U.K. in the last five years. The company did issue a release on the Singapore expansion, but Rolls-Royce Chief Executive John Rose in that release spoke only in very general terms about the Asian project. "These latest investments," Rose said of the Asian and U.S. expansions, "are further evidence of our success in aerospace markets and the continuing trend towards the globalization of our operations." "The company's Derby facility," the Rolls release noted in an awkward turn of phrase, "is planned to remain the center of expertise for large civil engines." 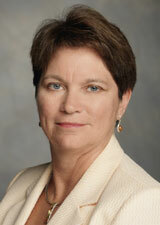 ©2007 Conway Data, Inc. All rights reserved. Data is from many sources and is not warranted to be accurate or current.